The book’s narrator is three weeks from retirement and coasting. His boss has just been asked to take over a flagging engineering department, and our narrator gets a week to assemble a swat team and figure out how to revamp the product development process. Buried deep in the organization is an engineer who has studied how Toyota does product development. We follow her as she first convinces the swat team and then the executives that they need to change the way they think about product development. We learn that product development is a knowledge-creating process, and learn what that means: Entrepreneurial leadership, responsibility-based planning, expert workforce, and set-based concurrent engineering. Before you fall asleep, note that the novel format helps make these concepts come alive. The swat team has to digest a new paradigm for product development, and then sell it to an executive who has the mistaken notion that lean product development should be pretty much like lean manufacturing. After the book convinces you that you can’t treat development like production, it goes on to describe in detail what does work for development in an understandable and practical way. I learned a lot about set-based design, and I really liked the description of responsibility-based planning and control. The book ends with a ‘where do we go from here’ section, offering large group interventions as a way to trigger participative change. The book didn’t offer a lot of guidance on exactly what to do, but it does draw an interesting parallel between the desired new product development process and the change process itself. Business novels, by their nature, provide ideas and examples, rather than specifics of how proceed in situations that differ from the ideal presented in the novel. But a well-written business novels such as this one provide good way to clarify important ideas in a quick-to-read, entertaining style. It’s easier to attack sacred cows in fiction, and easier help the reader visualize what might happen if a real paradigm shift takes place. If you liked Goldratt’s novel “The Goal” then you might stay up most of the night reading this book, just like I did. 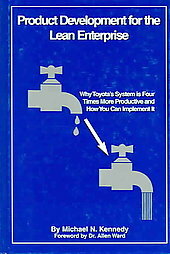 Product Development for the Lean Enterprise by Michael N. Kennedy, Oakela Press, 2003.